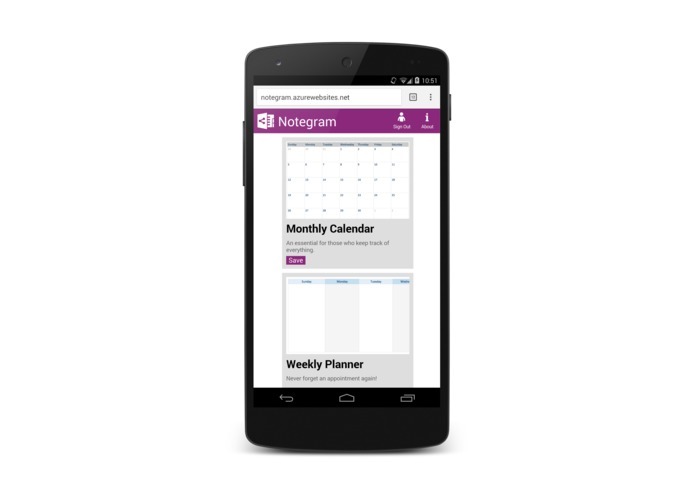 Notegram is a companion web app for Microsoft OneNote, a powerful note taking tool available on a wide variety of platforms - including Microsoft's own Surface line of tablets. Despite that, however, downloading templates has always been a pain. It requires installing extensions that are only compatible with the Windows version of OneNote, completely ruining a great experience. 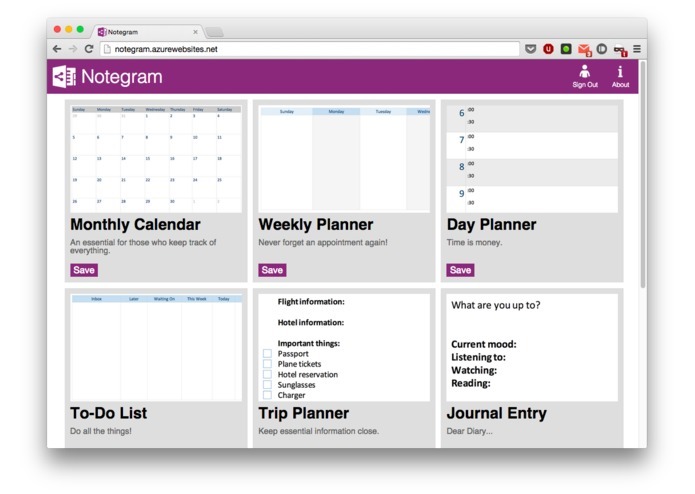 Notegram takes downloading templates to a new level of simplicity. Just sign in with your Microsoft account, press the save button on a template you like, and that's it, you're done - the template is already in your OneNote. No need to download or install anything. Templates are automatically saved to your default notebook section - usually "Quick Notes". Notegram is completely platform independent, does not require installing any addons or extensions - all you need is a web browser. I have ventured into new territory for me with this project - I've never worked with Node.JS, or any kind of APIs before. I learned a lot about Node.JS, web development, and working with REST APIs while building Notegram. Not just that, the circumstances under which I built it were new to me as well - LA Hacks is the first hackathon that I have ever attended, and it has been quite an overwhelming experience for me. I would like to turn Notegram into a fully featured network for sharing OneNote templates and pages. OneNote already has powerful sharing capabilities, but Notegram can take this to a whole new level - sharing with the whole wide world. 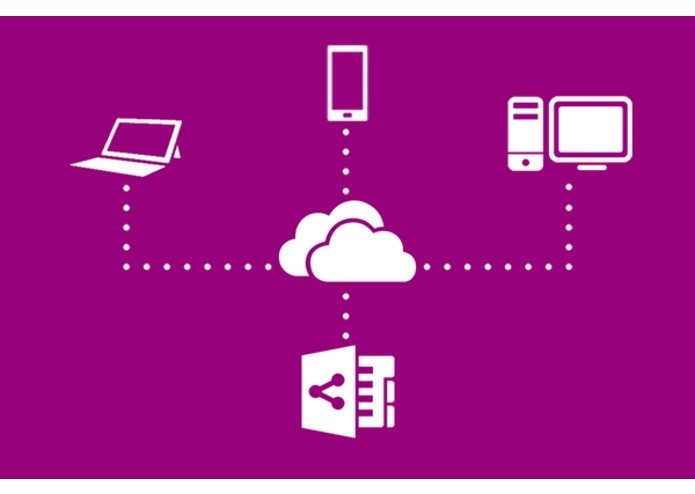 Notegram is powered by OneNote, Node.JS, and Microsoft Azure. Notegram uses icons from the http://modernuiicons.com project. 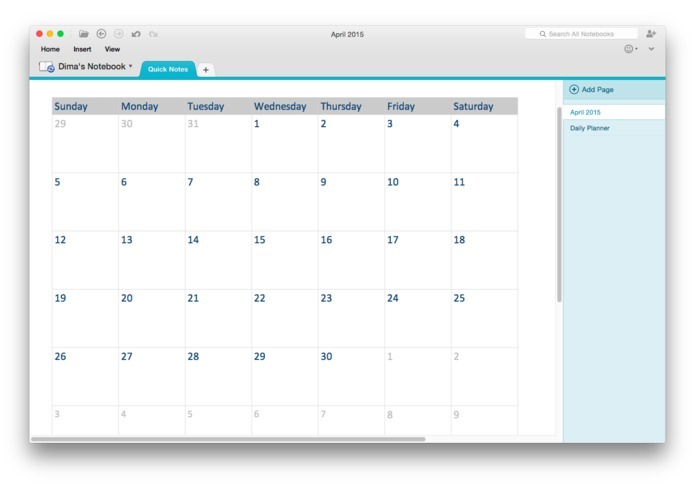 4/9/15: A new template, Accounting Journal, is now live! Go check it out! I am the developer of this project. I published an article about Notegram's latest update, please check it out! Notegram now has a Facebook page! Microsoft Russia has featured Notegram on its holiday card! I published an article about how Notegram was made - check it out.